Ronyi Las Silaen leads a team of Forest Protection Rangers who spend their days traversing the Riau Ekosistem Restorasi (RER) concession area situated on the Kampar Peninsula, Riau, Sumatra. A Ranger’s role is multi-faceted. Traveling on foot or by boat, they support a range of functions inside RER, including mapping landmarks, keeping trespassers at bay, engaging with community forest users, such as the fishermen on the periphery of the restoration area, as well as supporting the replanting of native-species and hosting visitors. Ronyi’s team of Rangers also perform the important task of overseeing the area’s water management, while he also gives special attention to the numerous old drainage canals in the forest, left behind by previous logging operators who ceased operating more than a decade ago. “Maintaining the right water levels on peatland landscape is an important part of our peatland restoration work, so we regularly check the dams we have built to block the old canals, to ensure they remain functional and retain water inside the forest area. “We also monitor the water table in the forest for changes between wet and dry periods in order to better understand how the hydrology functions,” says Ronyi. 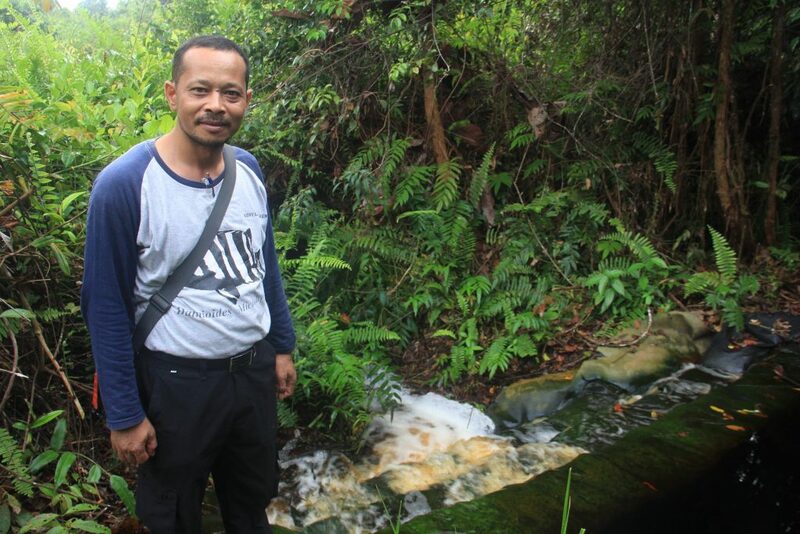 Ronyi Las Silaen, Superintendent of Forest Protection, at a dammed canal in Sangar area within the Restorasi Ekosistem Riau area. It took four people two days to place 80 sacks of sandbags weighing between 25 and 30kg to create the appropriate tiers. Ensuring water table is at a level at which the peat soil remains moist is a vital part of managing the health of peatlands and their diverse ecosystems. Water tables vary with seasonal rainfall and groundwater flow. When they are too low, the peat soil becomes drier and susceptible to fires lit illegally to clear land by burning. It also increases carbon emissions. “This is why the closing of the old canals is crucial to restoring the natural fluctuations of the ground water table, and maintaining a healthy forest,” Mr Ronyi. Since receiving its first license to restore the area in 2013, Restorasi Ekosistem Riau has identified 36 old canals spanning a total length of 116 km. The canals are between one and nine metres wide, and some are as deep as 1.5 metres. These canals were established in the 1980s by loggers who would use the canals to transport the logs they had felled from the surrounding forest. “The work that Ronyi’s team carries out is part of our goal to restore the hydrology of the peat forest and manage water table changes to near-natural seasonal fluctuations,” says Brad Sanders, Restorasi Ekosistem Riau’s Deputy Head of Conservation. Some of the old canals are used as landmarks by fishermen who use the rivers or as another way to enter the forest. So restoration is carefully managed in tandem with the community’s interests. Ronyi’s team’s goal is to raise the water level in 40cm-steps, in order to slow or stop the flow of water to retain peat moisture for longer during the dry season. At Sangar (pictured), Rangers have dammed the three metre-wide canal in terraces, according to the slope of the land which the canal traverses. Ronyi explains that the number of sandbags required depends upon the width and depth of the canal, and could range from 80 to 300 bags for a single dam. Sandbag dams are the first to be built at the lower end, or mouth of the canal, where it intersects with a natural river and drains water from the forest. This is where the greatest ‘head-pressure’ or weight of water is pushing against the dam. The sandbags are made from high-tensile polypropylene woven material, known as Geo-Reinfox, which is UV resistant. Upstream, or at locations along the canal’s gradient that are at 40cm elevation change from the first dam, a second dam is constructed from strong and sturdy recycled materials, such as aluminum pipes and sections of used felt conveyor belt obtained from APRIL’s paper mill manufacturing facility. The synthetic felt has extremely low porosity and has reached the end of its useful life, causing no environmental harm. “Once a year, Ronyi and his team will assess the status of the dam and, if necessary, repair or add sandbags,” says Sanders. So far, nine canals have been closed, totaling 29km, using 25 hand-built dams.